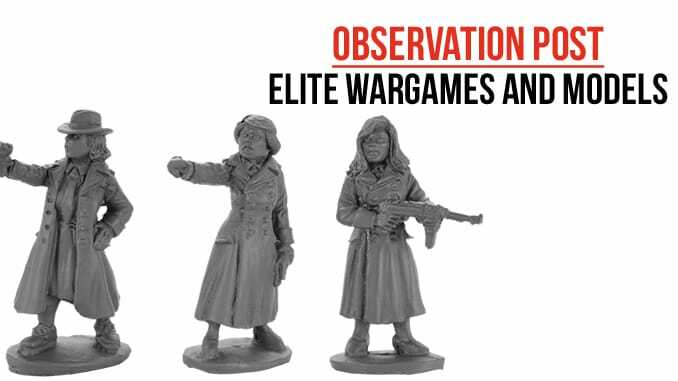 Elite Wargames and Models have had a somewhat ‘niche’ appeal with their ranges of female figures for the Dark Age, Napoleonics and World War Two. However, the figures produced are increasingly based upon historical reality, and the new British SOE Agents and German Secret Police are no exception. The SOE or Strategic Operations Executive consisted of secret agents recruited from a host of backgrounds who were sent into the German occupied territories to aid the members of the national Resistance movements or to carry out missions of sabotage and intelligence gathering. Many of these agents were women, sometimes returning to their homelands or plucked from the military. This pack of figures contains two figures designed to represent these brave heroes who often ended up captured, tortured and killed. One figure wields a Sten sub machine gun in a firing position, although more of a ‘Hollywood’ pose as she holds the magazine of the weapon rather than the area beneath the barrel. The other figures is aiming a pistol and has a bag across her shoulders, perhaps full of captured papers. Both are dynamically posed and look determined. The second pack of figures consists of three figures, designed to represent the German Secret Police or Gestapo who hunted enemy agents and tried to winkle out the Resistance members or similar in occupied territory. One of the figures is standing, pointing, perhaps picking out a target for arrest. The second wears a long trenchcoat or similar and holds an MP40 SMG. The last wears a shirt, tie and hat and is aiming her Luger pistol. Again, each figure is characterful and ‘looks the part’. These are fairly unique figures that are not found in other ranges. The overall sculpting style is fairly realistic and the faces in particular capture a determined group of women rather than victims. A nice addition to a range we’d like to see more from in the future.